Plants are very different from animals, and the first thing to realize is that the food groups and vitamins we need have no relevance at all to plant nutrition. Plant live on minerals from rock, dissolved in water, making everything else they need from them, from carbon dioxide in the air, and from the energy of the sun, unlocked by the process of photosynthesis. The only part of that we have any control over is those minerals, and plants use just three in significant quantities. These are the represented by the three numbers seen in the fine-print on fertilizer packaging, called the Fertilizer Ratio, and looking like ’20-20-20’ or ’12-5-15’. If we want an analogy with our own diet, nitrogen is the protein of the plant diet. It is the nutrient used the most, and indeed, it does go into all the proteins needed by plants, which are not as numerous as they are for us. The main plant proteins are all enzymes for growth. As well, nitrogen makes DNA, and the pigment chlorophyll for photosynthesis. From a practical viewpoint, we can see immediately that for plants to grow, cells must divide, and each dividing cell needs DNA. As well, without chlorophyll, no growth can take place. So nitrogen is the growing nutrient, encouraging new shoots, green leaves, and in our Thuja Green Giant, nice long stems, of a rich green color, and quick recovery after trimming. High levels of nitrogen are found in all general-purpose hedge fertilizers, and you should look for a big first number in the Fertilizer Ratio.’20’ or ‘30’ are numbers that indicate a fertilizer bursting with nitrogen. When you use a high-nitrogen fertilizer, it is easy to overfeed, and encourage soft growth, easily damaged by cold or insects. In extreme cases it is even possible to kill plants completely, as is seen when you spill some lawn-food on the grass, leaving a dead patch. So always follow the directions for dilution and frequency of application. In this case a ‘little extra for good luck’ can have exactly the opposite effect. This mineral is the second most important one for your hedge, because it develops strong root-systems, and balances the tendency of nitrogen to stimulate soft growth that is sensitive to cold, and more easily attacked by pests. Phosphorus is used by your plants as another essential component of DNA, so it is found in all the growing tips of both roots and shoots. Since a plant has a lot more roots than shoots, it needs a lot more phosphorus for the root-system than it does for the top growth. Phosphorus is the second number in that Fertilizer Ratio, and you will find big numbers, sometimes as high as 52. Your soil conditions are just as important as how much phosphorus there is in the box, because soil pH – its acid/alkaline balance – plays a big part in making soil phosphorus soluble, and so able to be taken up by plants. Slightly acid soils, with a pH of 6.5, have the best uptake, and if you have very alkaline or very acidic soil, you may not get the full benefit of the phosphorus fertilizers you use. Thuja Green Giant uses phosphorus to make strong roots, establishing itself well when newly planted, and sending roots deep into the ground to give drought resistance and the ability to absorb all the nutrients needed for optimal growth. For this reason, extra phosphorus, in the form of superphosphate, is recommended when preparing your planting areas. 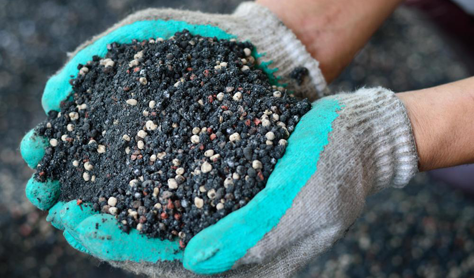 Work all phosphorus fertilizers well into the soil. they dissolve slowly, and only move a few inches a year through the soil. So scattered on top as an after-thought, once planting is over, really is a complete waste of time. Fertilizers sold as ‘starter’ or ‘planting’ aids usually have lots of phosphorus, and they are ideal for feeding freshly-planted trees. Use them during the vital first few months of growth. They really get your plants off to a flying start, and any extra remains in the soil for decades, so it is almost impossible to over-use phosphorus fertilizers. The last number in that Fertilizer Ratio stands for Potassium. This mineral is not used by the plant to make any structural components of its cells, but it is used inside the cell to keep everything rigid and strong, and its presence stimulates plant cells to build big, sturdy cell walls. This protects them from insects and cold. So you will see large numbers for potassium in ‘fall fertilizers’, designed to bring the growth of your hedge to a conclusion for the season, strengthening and thickening the stems, and increasing cold-hardiness and resistance to being pushed over by snow and ice. Plenty of potassium is especially important if you grow your Thuja Green Giant in colder zones, because cold-hardiness is an important aspect of good health for your hedge. That’s a lot to absorb, if you will excuse the pun, so in the second part of this blog series we will take a look at the minor nutrients, which play an important part in the color and vigor of your hedge, even though they are not shown among the ‘big three’ nutrients in your fertilizer. So you want to grow a screen or tall hedge, right? And you are trying to decide which plant you should choose. Well here are some good reasons – seven of them – why Thuja Green Giant remains the top choice of gardeners across the country looking to plant a screen or hedge. Screening is important in our gardens. Privacy means we can relax, and the enclosure created by a tall screen gives our gardens that sense of intimacy and completeness that is so important. Planting screening is often the first step in laying out your garden. Once that is established, you can move on to decorate the space inside, taking advantage of the shelter from strong winds it will give you. Inside a sheltered area it can be a whole zone warmer than your official ‘post-code’ zone number. So let’s look at Thuja Green Giant, and see more about why it should be your top choice. This is not just a claim by a salesman. Some years ago, the horticulture scientists at the University of Arkansas planted a wide range of hedging plants. These were small plants, placed out in a field. The Green Giants outgrew every other plant, growing into dense, upright bushy plants 10 feet tall and 5 feet wide in just 7 years. Starting with larger specimens, you will have a 10 tall, solid hedge or screen in no more than 5 years, and the first 5 or 6 feet happen in the first two or three growing seasons, especially if you use a fertilizer program and water regularly. All the way from zone 5, where winter temperatures can fall to minus 20 degrees Fahrenheit, all the way south and east into zone 9, where summer is long and hot, Thuja Green Giant will thrive. This is because it is a hybrid plant, created from two wild species of arborvitae. Hybrid plants display all the most vigorous genes, and mask the weakening ones, so these plants are tougher and faster-growing than either of their parents. Isn’t Nature wonderful? While deer have minds of their own, and can eat almost anything when hungry enough, they almost always leave the Green Giant alone. This is quite different from other arborvitae (Thuja species), which are typically eaten by deer on a regular basis. If you see a general statement that ‘arborvitae are not deer-resistant’, that doesn’t apply to Thuja Green Giant, which is not attractive to them at all. Even if some light grazing does happen, the growth-rate is so fast that it will grow back in a few weeks, once spring comes. We all know about plants that need specific types of soil, such as ‘acid soil’, or ‘sandy-loam’, and that will grow poorly in anything else. Because of its hybrid vigor, this doesn’t apply to Thuja Green Giant. Not at all. In almost any soil type, from sandy to clay, and from acid to alkaline, this evergreen grows well. Of course, in sandy soils you will need more water and fertilizer, and some clay soils are regularly saturated with water, which is not good for most plants. If you do have more ‘extreme’ soil, put a little more into soil preparation, by adding lots of rich organic material, which holds water and nutrients in sandy soil, improves the drainage in clay soils – and counters high alkalinity too. Especially in colder regions, winter is a long, dull season, with not much happening in the garden. So evergreen plants are great, because they stay green, and make the garden look brighter. The last thing you want is to have your lush, green hedge turn bronzy-brown as soon as colder weather sets in, and stay that way until all the new spring growth has flushed out. Sadly, quite a lot of the traditional hedging plants do exactly that. Not the Jolly Green Giant, who stays a bright, rich-green throughout the winter, with no yellowing or bronzing, brightening the garden all winter long. Most evergreens do very badly in shade. Some that do grow well in it, such as yew trees, or hemlock, are slow-growing, so usually they are only used in the deepest shade. If you have moderate shade, with some direct sunlight for part of the day during spring and summer, then rather than use those slow-growing plants, pick Thuja Green Giant. It will grow vigorously and stay dense even in 50% shade, standing apart from other arborvitae and most other evergreens. If you have a lot of beautiful shade trees on your property, the chances are that the places you want hedges and screening will not be in full sun. Simply by choosing Thuja Green Giant you know that your hedge will turn out great. Some other arborvitae are very prone to pests and diseases. Some plants like Leyland Cypress were widely planted in the past, only to fall to disease in many parts of the country. if you are planting a new hedge, or replacing an old one, Thuja Green Giant is an excellent choice, because it is much less susceptible to pests and diseases that most other hedge plants. Even the most reputable university and school sites say ‘No serious insect or disease problems’ when describing this plant. Yes, it is possible to have some attack by the insects called ‘bagworms’, which are caterpillars that strip branches of their leaves. But like a deer attack, because of the fast growth-rate of this tree, any damage will quickly be replaced by new growth. It is also possible, if the soil you plant in is almost constantly wet, that root-rot diseases will strike. But that will happen with almost every tree in those conditions, and it is the one time where another plant is the best recommendation for a hedge. 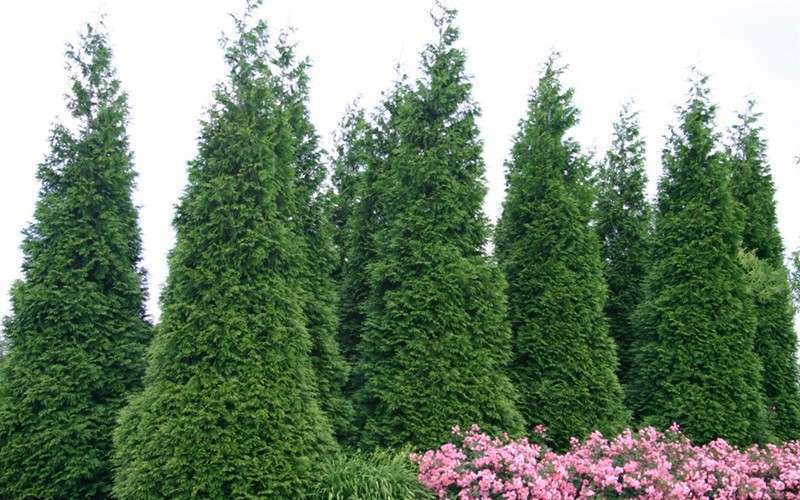 Taken overall, these are seven very sound reasons for choosing Thuja Green Giant for a hedge or screen – it’s hard to go wrong with this remarkable evergreen. We try to plan carefully when we start a project, but sometimes we have insufficient knowledge, and sometimes the situation can change suddenly, making our plans come unraveled. This happens in any part of life, and it can happen in our garden plans too. So there are situations where we plant something, perhaps a specimen or a hedge of Thuja Green Giant, and then after a few years we discover a problem, or decide to make a change. The reasons for moving established plants are many. Perhaps you have decided on some construction, and the plants are now in the way. Perhaps you need to open a section of hedge for vehicle entry, planning to put it back later. A neighbor might have suddenly added an extension, and you just as suddenly need privacy. Maybe you are even moving to a new house, and you have arranged to take plants with you. Whatever the reason, here is the dilemma: you planted some specimens, or perhaps a hedge, or Thuja Green Giant, a few years ago. Maybe just one or two years, maybe 5 or 6 years ago. The plants are well established, and they have grown well, so you have lovely specimens, of a substantial size. How feasible is it to move them? How can you go about it? What preparation is needed? These are all the questions that arise when you find you need to move established plants of Thuja Green Giant, or for that matter, other evergreens. How Feasible is Moving Established Plants? The answer to this depends mainly on how long the plants have been in the ground, and how big they are. The main limitation is a practical one – the bigger the plant, the larger the root-ball will need to be, and so the heavier and harder to handle, the plants will be. Of course, you can hire professional help, and with that, even very large trees can be moved with the help of a tree spade. If you have access for machinery, a contractor can come in, and with a tree spade of a suitable size, pick up and move around anything in your garden in a matter of minutes. Considering the high value of large plants, the investment in moving them is often worth it, as it will be much less than replacing them with trees of the same size. If you want to do the job yourself, then with the help of a few friends, and your combined muscle power, you can move even large plants yourself. So the short answer is – very feasible if you have the ability to move them around. When is the Best Season to Move Established Plants? The idea seasons for moving are in early fall or early spring in colder areas where the ground freezes in winter, or anytime between fall and the end of winter in warmer regions. At that time the plants are dormant, and they need much less water, so there is a window available for them to re-establish their roots before warmer weather comes. Trees that have only been planted for a couple of years could probably be safely moved at any time except for July and August, if they are carefully watered for a couple of months after moving them. What Preparation is Needed Before Moving Established Plants? If our Thuja Green Giant, or other evergreens, have been planted for more than a couple of years, some preparation is a good idea, if you have the time available. As much in advance as possible – a year is considered best – take a spade and cut straight down around the root ball, but without moving the plant. For very old plants, doing half one year, and the other half the next, by dividing the circle around the plant into alternating segments, is often recommended. This is what professional nurseries do with all their trees, to develop roots closer to the trunk, and make transplanting easier. You can do it too, and it will make moving your plants much safer, if they have been in the ground for a few years. If you don’t have much time, then you can of course just dig and move the trees in a single operation, but the risk of failure is greater. Immediately before you dig up your trees, give them a deep, thorough soaking, even if the ground is damp. Do this 24 to 48 hours before moving the trees. How Big a Root-ball do I Need? The bigger the tree, the bigger the root-ball. This seems obvious, but how big should they be? For a 5 to 6-foot tree, the root-ball needs to be at least 20 inches across, and preferably wider. For an 8-foot tree, it should be 24 to 30 inches in diameter. For every 2 feet added in height, add 6 inches to the root-ball size. So, a 15-foot tree will need a 4 to 5 foot root ball. That is heavy, so you will need equipment or a team of people to move that one! When it comes time to dig the trees, and you are doing this by hand, here is what to do. Measure the size you want the ball to be, and draw a circle around the tree on the ground. Now dig a trench, with that circle as the inside wall, all around the tree, going down about 2 feet. Remove all that soil, and then trim the root ball into an upside down rounded cone, until it is sitting on a small column of earth. Now wrap burlap tightly around the roots, securing it with rope, and only then can you cut all the way underneath and release the root-ball. Once you have the wrapped tree ready to go, you can safely move it to the new hole, and lower it in to the same depth it was before. Put back some soil, removing the wrapping as you go, and firm it down around the roots, until you have the hole about two-thirds full. Then flood it with water, and let it drain away, before returning the rest of the soil and filling the hole completely. As you can see, this is a fairly complex procedure, but once you have moved that beautiful big tree, you will be so pleased with the result that you will not mind the work at all. Hopefully you won’t have to start moving big Thuja Green Giants around your property, but if you do, now you know how to do it to maximize the chances of survival. As you can see from the picture, working with hedges and evergreens doesn’t have to be dull. It doesn’t matter if you have children, or do it for your own inner child, creating fun and amusing ‘pet plants’ around the garden is easy with Thuja Green Giant. Because this plant is so incredibly fast growing, it takes just a few months to do what might take years with something slower, like Yew. And because it is so fast-growing, if you get bored and want to go back to a plain look, then most of the time that will be easy too. You are only limited by your imagination in what shapes you can create with Thuja Green Giant. 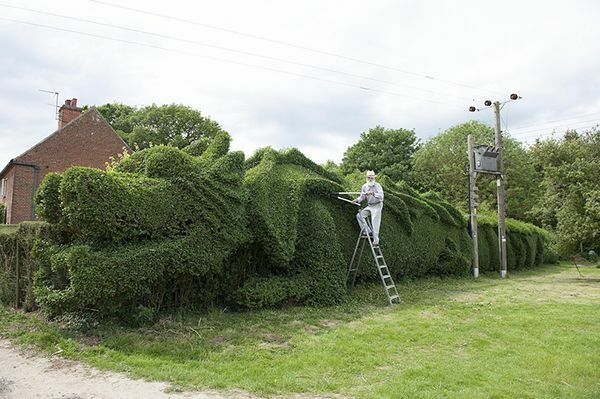 This skill, called topiary, has origins going back centuries. There are paintings on the walls of ancient Roman tombs showing plants clipped into ornamental shapes, and the art was very popular in Italy during the Renaissance and in Holland too. Some simple shapes are still commonly used in gardens – balls, pyramids, both round and square, and spirals are seen in a lot of more formal gardens. These simple geometrical shapes are easy to produce, but more complex shapes, like puppies, pigs or elephants, are possible, or objects like teapots, cars and trains too. So here are some tips of how to set about making interesting topiary objects to bring fun and entertainment to your garden. Your own, and all the kids in the neighborhood too, will love you for it, and you will put a smile on the face of everyone who passes by. Make sure you choose a place where your work of art is easily seen – why keep it all to yourself? While you might use electric or gasoline hedge trimmers for a regular hedge, for topiary hand clippers are best, at least for the detailed bits. Not the big ones your grandfather used to use for hedges, but smaller, sharper ones available today, with narrow blades and a pointed tip, that allow you to get into corners and cut into, as well as across, the plants. Keep these sharp and well-lubricated, and you will find that hand-clipping is great exercise for your pecs. A good pair of battery operated shears is still helpful for larger areas. Go with an 18” or 24” blade, nothing longer. A longer blade will just get in the way, as will an electric cord, and gasoline trimmers are noisy to work with. Choose a new-generation battery trimmer by a reliable manufacturer – they work like a charm, and with two batteries you will have no ‘down-time’. Remember that the key to success is frequent trimming. The more you trim, the denser the growth becomes, and the more pronounced your design will be. Four to six clips a season is not too much, and in fact it is when you are only taking an inch of that you know you are on the road to success. Plan on clipping at least once a month, and maybe every two weeks during spring and early summer. To build the framework for narrow shapes, like the handle of a teapot for example, you need some stiff wire. Copper wire is best, although for a bigger project aluminum wire is a lot cheaper. If you have some scrap electric cable, that is a good source of copper wire. 6-guage wire, which is 4 mm thick, is good for smaller to medium-sized branches. You need to anneal the wire first, and this is easy, the next time you have the barbecue on. Roll up the wire, and place the coils on the hot coals until they are glowing red-hot. Once they cool, clean them in a solution of vinegar and salt. Use 2 tablespoons of salt per cup of vinegar, and boil the coils in it until they are clean. Once you have annealed the wire, you will see that it is soft and easy to bend, but once twisted it stiffens and holds its shape – exactly what you want. Imagine you want to make a teapot handle. Select a long shoot – it doesn’t have to be the full length yet, and twist one end of a wire loosely around the branch the shoot is coming from. Then coil it around the stem, and bring it out and around until you have the shape you want. If the stem is not long-enough, continue with the bare wire, and you can gradually attach the stem as its grows. Another approach is to use thin flexible long rods to create a framework, and then tie-in a branch or branches to cover the rod. Once you have the branch in place it will soon start to send out side-shoots. Trim these when they are still short, and as more and more are produced, gradually you will have the material for the part you are creating, and you can thicken and shape it as you wish. Depending on the shapes you want, sometimes bamboo poles can be used to guide you for the basic form. To make a cone, just make a tepee shape out of four bamboo poles, space around the tree and tied together at the top. For a square cone, place on at each corner of a square drawn on the ground in string. For a circle, use 6 canes, or 8 for a big cone. Use a string attached to the trunk at the base to draw a circle on the ground, so you know where to place the canes. These canes act as a trimming guide, so you keep everything straight. While simple shapes can be made from one tree, for larger objects the quickest way is to plant several trees in a group, placing them so you have plants where you need them. Remember to allow at least a foot of growth outwards to the final shape you want, and for bigger shapes allow 2 feet. By planting exactly where you need them, you can create four-legged creatures, with each leg a plant, with the upper parts bend over and tied together to make the body. Look on-line for inspiration – you will be amazed at what can be done. For a fun garden hobby that will soon get you a name in the neighborhood, take up Green Giant topiary and amaze yourself. Don’t end up like this. . .
Hedges have a long life, but sooner or later they can reach the end of that life, and become just too big. Disease may strike, or a severe storm, but the biggest problem is usually that they become too broad. No matter how tightly we trim, we end up adding a little width each year, until eventually the hedge encroaches on our garden, neighbors’ property, or public spaces such as sidewalks. Some novice gardeners try to control this by cutting back hard, leaving bare branches, but for almost all hedges this simply doesn’t work. The main problem is that all the commonly-used plants, like cedar and arborvitae, cannot sprout new growth from bare wood. They can only regenerate from wood with some foliage still on it, and hard cutting back usually means the end of your hedge. To prevent this, and keep your hedge healthy and functional for decades, it is vital to control the width before that point of no return is reached. Otherwise, you are looking at significant labor and costs removing an old hedge and re-planting, as well as several years waiting for the new hedge to grow. If you do have to remove an old hedge, then growing a speedy replacement is usually high on the list, and that is where Thuja Green Giant steps up – the fastest thing on roots, this reliable evergreen is the number-one choice among knowledgeable gardeners to replace a hedge that has been removed. Forward planning is important, so let’s consider some ways we can extend the life of an existing hedge, one newly planted, or an older one that you have been tending for some time. The biggest mistake, and the most common one too, of inexperienced hedge-growers, is to leave trimming until the hedge is as tall as you want it. If you do this the internal structure of your hedge will be weak, with a small number of very tall, straight branches reaching upwards. These tall branches are vulnerable in several ways, chiefly to bending outwards and snapping if the upper part is weighed down with snow or ice, or if fierce winds dislodge them from the hedge. Once these branches go, big spaces are left open, and the visual effect of your hedge is lost. It is hard to fill in these large gaps once they develop, and it can mean the end of your hedge. The solution is to lightly trim the top of your hedge, beginning as soon as it is planted, and continuing throughout the growing phase of its development. This encourages lots of internal branching, so that no part of your hedge is vulnerable to opening out and creating a big gap. Any pieces that could become dislodged will be small, and smaller spaces fill in quickly from lateral growth by the surrounding parts of the hedge. This is the best way to extend the life of your hedge, and it is something to pay attention to from the moment you plant your hedge. The correct profile for a hedge should be a tall narrow pyramid. The base should be wider than the top, and the top should be kept as thin as possible. There are several ways to achieve this, either by free-hand trimming or using a wooden guide you can assemble at home. Even just holding up a long spirit level will show you if you are leaning inwards or not. Whatever way you choose to check it, keeping that inward lean will serve several purposes. Most importantly, it will let light reach the lowest branches, and so keep them vigorous and healthy for decades. Once the top growth widens, it will draw up water and nutrients, starving and shading the lower parts, as your plant aspires to become a full-sized tree. When you are trimming, you should expect to remove considerably more growth from the top, which is more vigorous, than from the bottom. If you aren’t, that is probably a warning that you are not trimming enough from the upper parts. 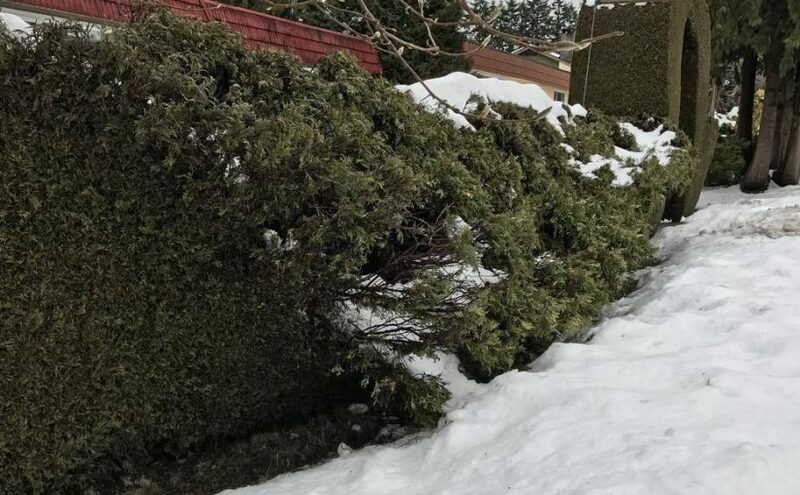 The biggest danger to any hedge, especially a tall one, is breakage from snow and ice. If this builds up on the top, then it can split the growth and pull down branches. They may in turn break, or if that doesn’t happen, be forever after prone to falling outwards and ruining the look of your hedge. Building internal structure will reduce this risk, but in addition it is important to maintain as narrow a top as possible. A lot of people pay attention to cutting the top rounded, rather than flat. This is important too, but not as much as keeping a narrow top. Rounded or square, a width of less than a foot, even on a very tall hedge, will help it survive the worst storm. A good fertilizer program throughout the life of your hedge is the best insurance against an early death. Sturdy growth, resistant to pests and diseases, and able to grow vigorously, is important not just in the years of development, but for the mature hedge too. Just as our own diet, or that of our pets, should change as we grow older, so for your hedge that high-nitrogen diet of youth should be shifter to something with more potash (potassium) in it as they age. Hedge fertilizers sold for fall use have extra potassium, and they can be used all season on a hedge that has reached its full size. You will get less extension growth, which means less trimming, and the growth you do get will be denser and more compact – better able to resist harsh weather, drought, pests and diseases too. During the establishment phase of your hedge, periods of drought mean periods without growth, so they add time to that needed for your hedge to reach the size you want. Drought also weakens the plants, and in severe cases can lead to death, even in a hedge that has been in place for several years. Although watering in fall, winter or spring will almost certainly be unnecessary after the first few years, a few deep soakings during summer dry periods will really make a difference, not just to the appearance of your hedge, but to its health and longevity too. These are some simple, concrete steps you can take to keep your hedge growing well, and keep it healthy and trim for decades. That big job of hedge replacement can be something only other people have to think about, because you grew yours the right way.